Summer is almost over. I just saw the Farmer's Almanac is predicting a "bitterly cold" winter for my state. Gee, I can't wait. I've often wondered how the hell I ended up living in a state that has more gray days than sunny, no ocean and gets "bitterly cold" in the winter. Nothing against my state, I just can't figure out why/how I didn't end up someplace warmer. "When we retire," Tim tells me. Um, is that word or concept even going to exist when are the so called retirement age? Maybe. Until then, I'm getting all crafty to preserve that summertime feeling and have it all year round. This week's Pinterest Poser** is all about making summer last all year. 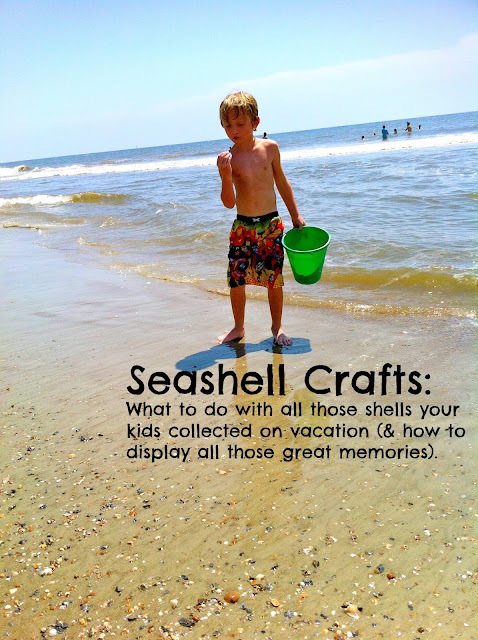 As well as what to do with all those seashells you and your kids spent hours looking for on vacation--creating Memory Displayers. 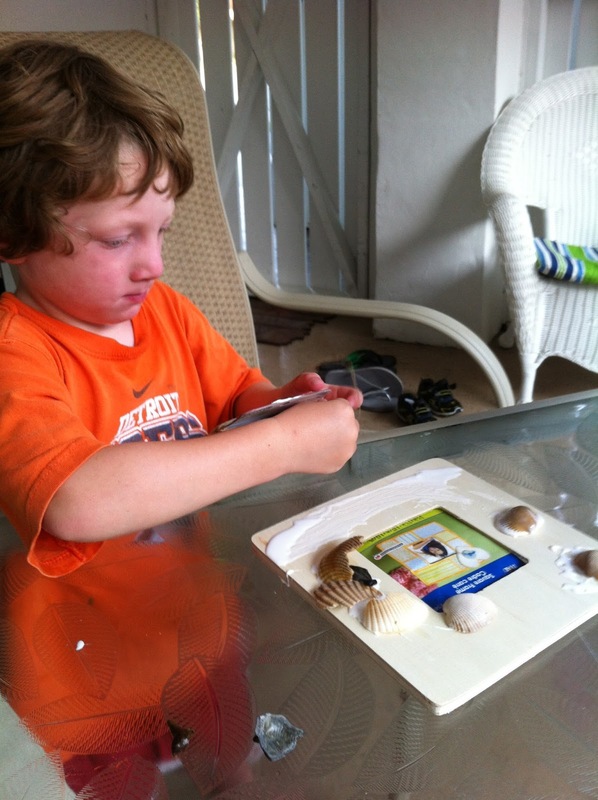 Before we left on our trip, I bought wooden frames at Michael's for $1.50 and glue for around $2. I was prepping for any rainy afternoons we might have while on vacation at the beach. We got lucky and didn't have any total rain outs. 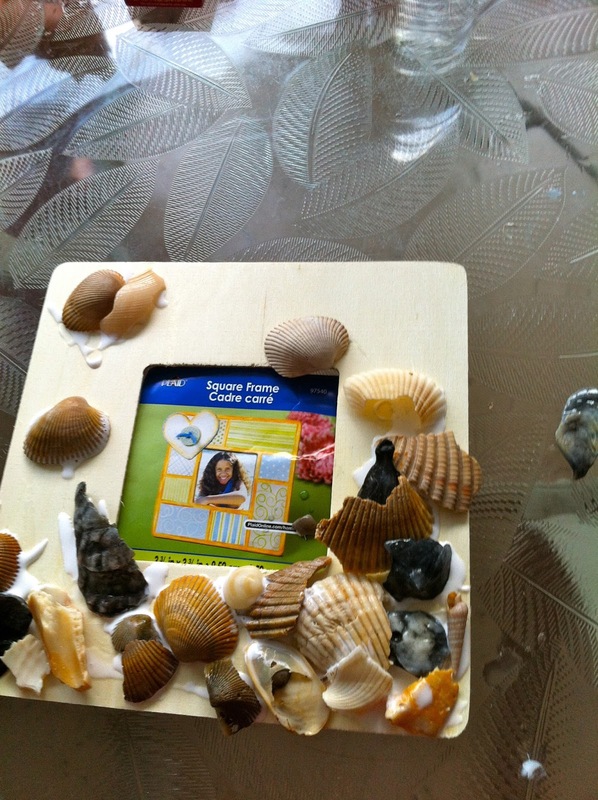 But we still spent one of the afternoons making seashell picture frames. 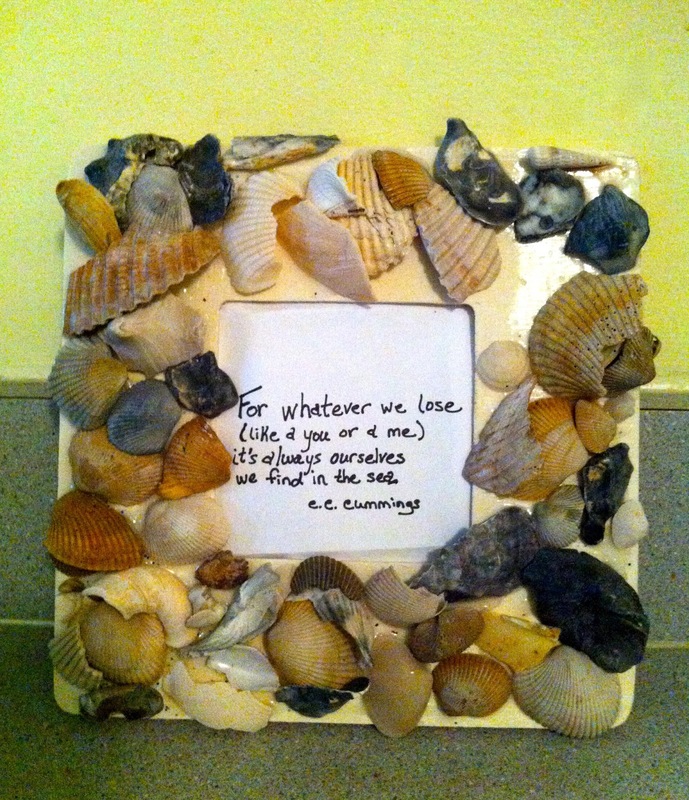 The kids picked out the shells they wanted to keep and washed and dried them. Then we simply started gluing. I was pretty hands off and let the kids do their crafty thing. It was an all-ages type craft. My three-year-old put a few shells on and then got back in the pool. Lucy however, got out her paint and glitter and enhanced her shells. She spent a couple hours on her frames. We did this project last time we were at the ocean and the frames have hung on our wall reminding us of our fun summer vacations. Apologies for the blurry picture. We made these frames summer of 2009 and they've been hanging on our walls ever since. 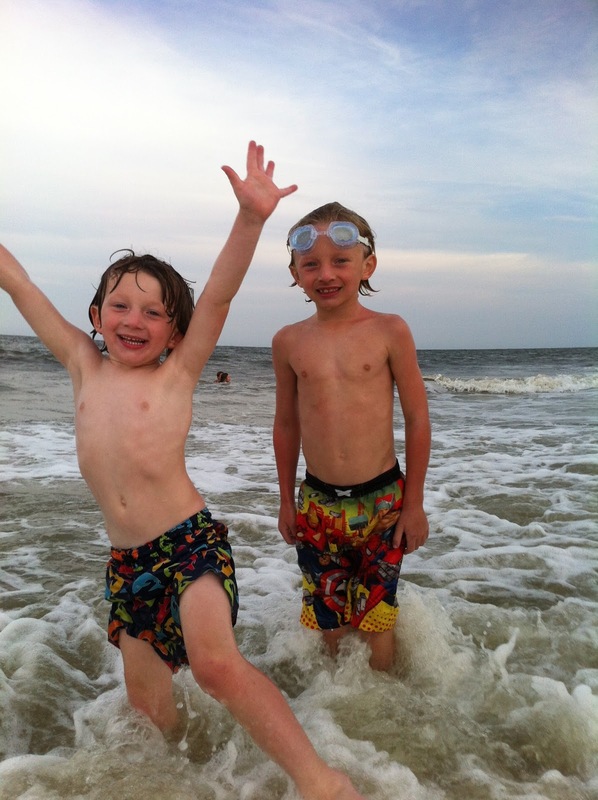 It's fun to display a picture of the kids when they were on the vacation. And to see how much they've grown and changed. Or give them as gifts to family members that were at the beach with you. I haven't printed any pictures from our beach trip this summer, so I put in my favorite beach-y quote instead. I got this next craft idea from the amazing Kelle Hampton at Enjoying the Small Things. I pinned it and then I made them too. It's my newest beach/summer craft/memory displayer and I love it. I found an old board in the back yard the kids were using to make each other walk the plank. Tim cut it into 4 X 6 pieces. 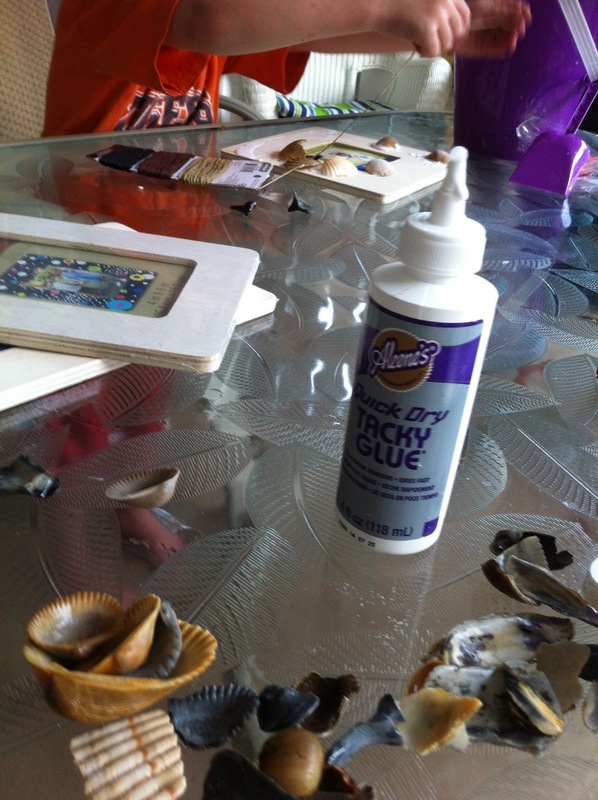 I used stain and glue I already had, along with Mod Podge that I always have. 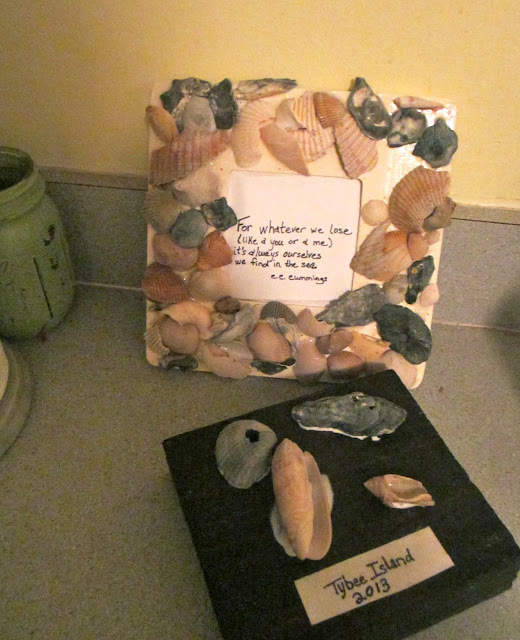 My dream is to have a mudroom with all the shell art displayed from all the vacations over the years. It doesn't have to be the ocean, it can be from a lake or a nature walk with rocks, leaves or dried flowers or feathers. The possibilities are endless and so is summer! 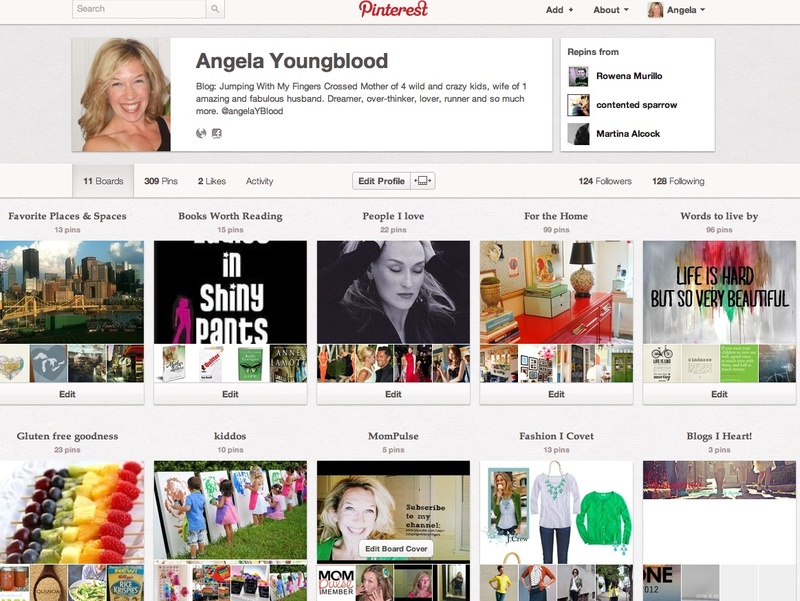 I would say I'm actually making things FROM Pinterest, but every Friday I'm sharing a new project or recipe that has been inspired by Pinterest. Or something like that. 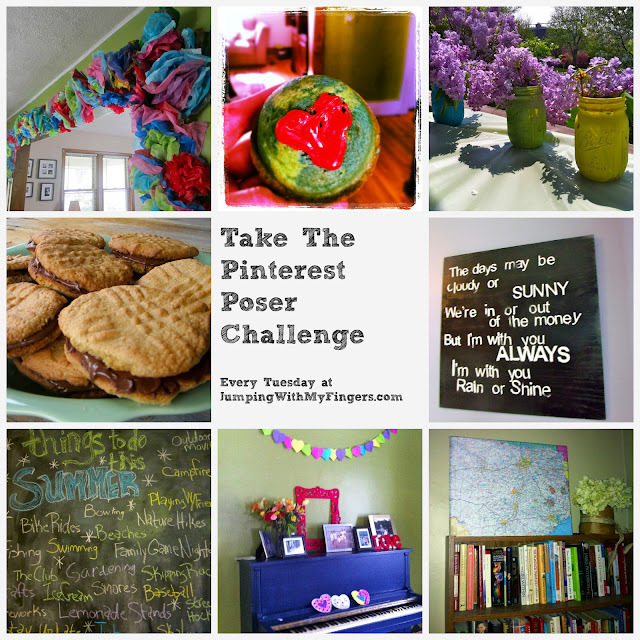 I am totally a Pinterest Poser. I will be better in the new house. I promise.